I'm very excited about this one you guys! This edition of ONe-On-1 features Christian R&B singer, Erica Diamonds! Erica is the first Gospel Artist to be featured on LivingTru.com, and it's an honor to have her! Please don't hesitate to hit the link below to check out her new single! Erica! It’s so great to have you at LivingTru.com! Thank you so much for speaking with me! Awww! I'm so excited to be here. Thank you for having me! It’s my pleasure! You’re actually the first Gospel Artist that I’ve had on LivingTru.com, so this is a really big deal for me! So for starters, How did you get started in music? and what inspired you? Well, I've always had a passion for music. My family tells me all the time that I was a singing baby, lol. So, I've always been influenced by music. As I got older it sort of progressed into me wanting to write and perform. Lol Okay, so clearly your interest in music started at a very young age. Now, I know that you write your own songs, but where do you get your inspiration from? As a Gospel Musician, I'm often just inspired by the power of God. I can be in a church service just witnessing the awesome power of God, when I'm inspired to write. Also, when I think of the struggles that people around me are faced with everyday, it inspires me to write as well. That is probably why I write so many songs about relationships, because even as Christians, we have relationships and need direction. That’s true. We Christians are still people, and we all need to listen to music that we can relate to without having to be limited to one genre. I know you’ve talked about this a little bit already, but what role does God play in your life? Ari, God is everything in my life! Literally! Lol, I'm a PK. So I was born and raised in the church. And even when I tried to stray away, I came right back to God. It's impossible to stay away from someone you've known your entire life without feeling like something is missing, you know? I know exactly what you mean! That just shows how awesome God is, the fact that he pulls you back even when you call yourself trying to get away from Him, lol. So, is that why you decided to pursue Christian R&B? Or should I say, “R&P” music? Actually, it was in 2009 when I first started to record any type of music. I started off with a Praise & Worship sound. My group, "High Praise" and I recorded a three track EP called, 'Brand New Morning'. So initially, I was leaning more towards that style. But I've always loved R&P, and it was something that I wanted to try. So in January of 2011 I decided to start recording R&P, and the response I have received in just two months has been amazing! Awesome! We all want our hard work to be recognized in a positive way. So as far as your message goes, what do you want people to take from your music? You know, I want people to see real life! Christian music is at a point where If you sing about a relationship, it's automatically assumed that you are not a Christian. I can't even wrap my mind around that. There are so many married Christians. How did they get married? I'm sure they had a relationship prior to that marriage right? and during that relationship they probably were faced with some of the issues that my music covers. Now, with that being said, If they would have had something similar to my music to listen to, God may have spoken to them through that music concerning that relationship. I feel like the Church sometimes hides behind Religion and pretends that real life doesn't happen. But it does. Even the bible discusses relationships. So I really want people to be able to relate to the 'Real' content that my music delivers, and also be able to find hope and the peace of Jesus through my lyrics. Beautiful, I absolutely agree! There has to be a balance in life, even as a Christian. Nobody’s perfect, and we all go through things. Personally, music gets me through a lot of issues on a daily basis (lol). Off the music for a minute, what changes do you hope to see over your lifetime? I would like to see the church 'lighten up'! Not compromise, but seriously, just see reality, because life happens. Haha, I’m with you on that one! So Erica, do you remember your very first performance? How was the experience? My very first performance was at a school play where I sang a duet. I was really young, maybe 5-years-old, I can't remember the details but I remember feeling like it was the biggest night of my life (lol). Aww, that’s sweet (lol). So since that first time on stage, what has become your greatest ambition? Honestly, my greatest ambition is to do the will of God. I'm ready to do whatever God wants me to do. If its music, fine. If not, that's fine too. I'm just at the point in my life right now, where being obedient to God is a priority for me. Wow, we have a lot in common! I feel the exact same way! God’s will is always my first priority. You see things a lot more clearly when you focus on Him. I love that answer (lol)! Tell me, as far as life or music, what has been your biggest moment thus far? The biggest moments for me have been the enormous amount of support that I have received from fans! Its been crazy, just the Love and support that I get when I'm traveling & performing. Also the support I’ve been getting from other Christian performers like Canton Jones, T-Haddy, & so many others. It's priceless to have people in your corner that believe in you. Very true, especially people that can relate to what you do. Now, I know that I’ve kept you for a long time, so this is my last question (lol), do you have anything big and exciting coming up in the near future? Yes! and I'm so excited to share it with you first! My video for my single 'Secrets' has just been filmed. We wrapped up a few days ago. So be on the lookout for that in the very near future. Also, My Mixtape 'Introducing Erica Diamonds' dropped in April of this year. I'm really excited about that! The mixtape is hosted by T-Haddy & it really shows my fans who I am as an artist. Also, my single, 'Secrets' is getting national airplay on radio stations. I'm really excited about that because a lot of urban Gospel Artists don't get that opportunity. So I'm very grateful. That’s really great Erica, I’m very happy for you! And I‘ll definitely be on the lookout for everything that you’ve got coming up! Thanks again for stopping through, and please keep me updated on your success! Guys, you know what to do! Connect with Erica on all of her social networks. Make sure you keep up with what she’s doing! 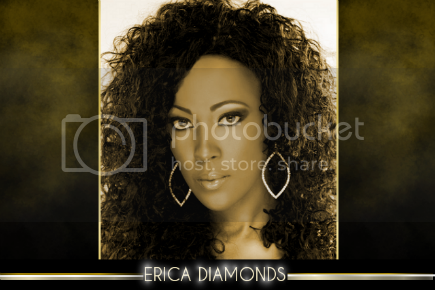 Check out Erica Diamonds' latest single "Secrets" I promise you'll love it! I really like this song! Its really nice.